Despite the public holiday, recently decreed by the Rio city council to ease the city's chronic gridlock during Francis' visit, traffic stands at a near standstill in several parts of the metropolis. Authorities' closure of Copacabana, a 2.8 mile-long stretch of beach that's also a key thoroughfare, snarled traffic in the neighborhoods of Botafogo and Flamengo, where hundreds of backed-up buses clogged the roads. Brazilians love crowds -- and most gatherings that bring out hordes of people end up taking on an almost Carnivalesque atmosphere. 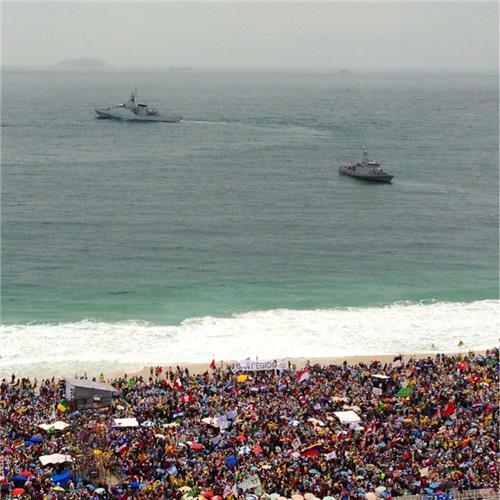 Thursday's mass migration to Copacabana beach was no different. 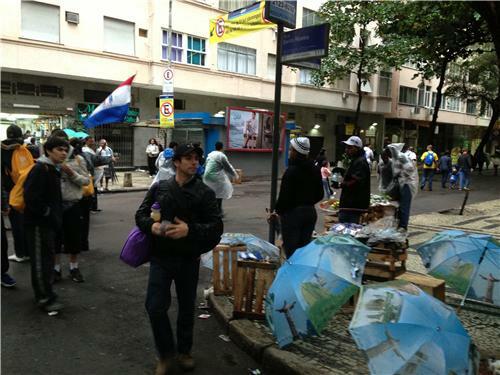 Musicians tapped out samba rhythms on tambourines, and vendors offered popcorn, biscuits and umbrellas. Groups of young people from countries including Chile, Britain and Puerto Rico also sang little jingles in a bid to compete with the chant "I'm Brazilian, with much pride, with much love" -- a frequent refrain during both Carnival and the protests. Jenny Barchfield, AP reporter based in Rio de Janeiro, captured some sounds from one of the tunnels linking the Botafogo neighborhood with Copacabana, where the Pope is due to arrive in about an hour. Watch this time lapse of the Copacabana stage in the making a couple of weeks ago. 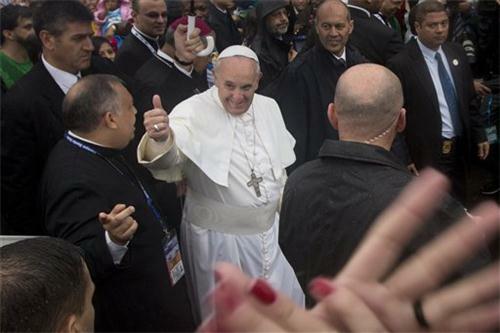 Pope Francis will stand 8 meters above the crowd of about 2 million people expected to attend. And he'll have plenty of room as the stage is 33,530 square feet (3, 115 square meters). 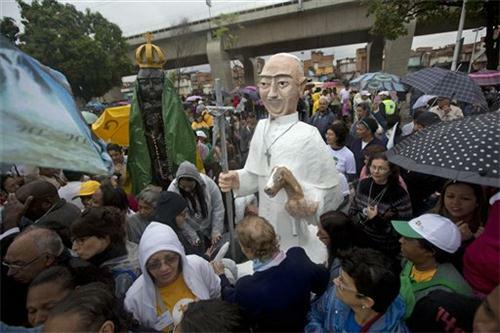 Nonstop rain forced church officials to move the pope's Sunday Mass from Guaratiba to Copacabana beach. Here are some images of the muddy site. On this drizzly winter day, enterprising street vendors sold umbrellas printed with pictures of sun-drenched Rio landmarks like Sugarloaf mountain and Christ the Redeemer statue to the people flooding Copacabana beach. 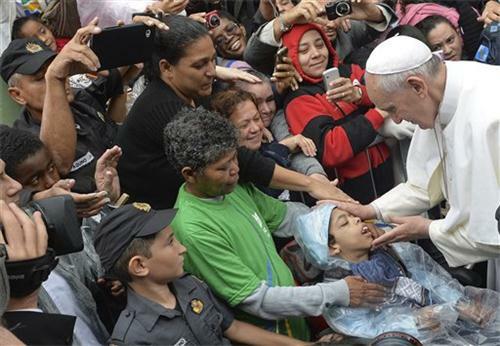 Pope Francis didn't wait long to take his first international trip. 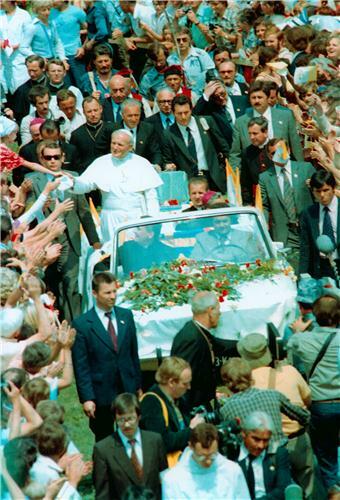 But if he wants to catch up to the famously globe-trotting John Paul II, he has his work cut out for him. 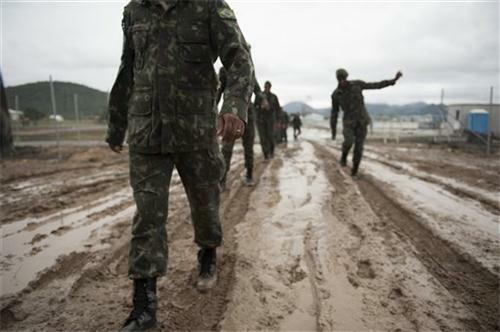 In an earlier post we heard from Jenny Barchfield, AP reporter based in Rio de Janeiro, who was standing inside one of the tunnels linking the Botafogo neighborhood with Copacabana. Barchfield has worked her way to the tunnel exit and has sent in another audio dispatch in which she describes the festive atmosphere. The Argentine-born pope showed his native colors: 23 minutes into his roll down Copacabana beach, the pontiff accepted a sip of what appeared to be mate, the traditional tea of Argentina that's also popular in southern Brazil. Here's the pope sipping what appears to be Yerba Mate, the traditional tea of Argentina. 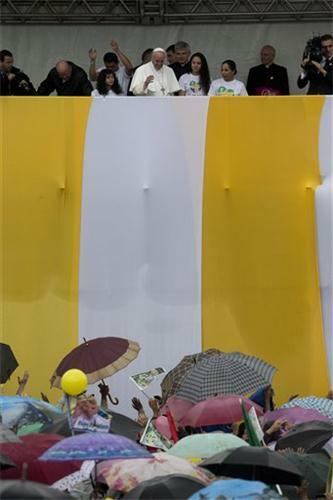 AP photographer Victor Caivano captured this moment as the pope arrived in Copacabana. Francis has built much of his schedule around high-profile events that send him straight into unpredictable, potentially chaotic environments -- without the protection of the bulletproof popemobile used by his two predecessors. 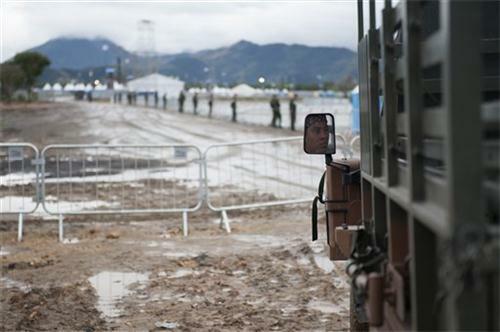 Security officials have said the stiffest challenge will be providing security for the pope's two events on 2.5 mile-long Copacabana beach. 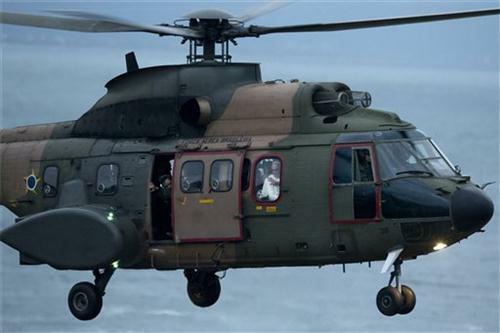 • Six Brazilian military aircraft will provide transportation for the pontiff. 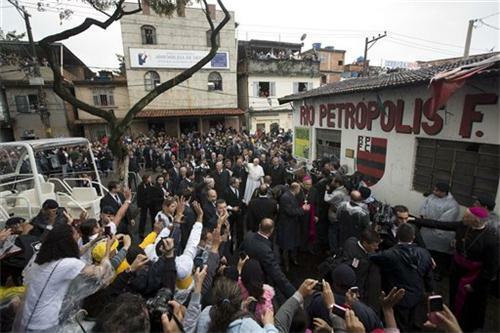 The helicopters will let Francis avoid Rio's snarled traffic and the dangers of land travel. 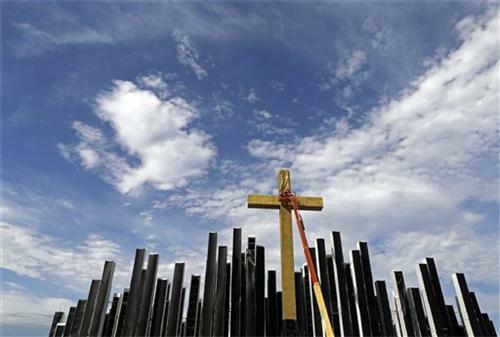 • Federal, state and local governments are expected to spend a total of around $52 million on all the security and logistical measures for the papal visit. Copacabana Beach will now be the location of the Vigil due to flooding of Campus Fidei. Pray for those who prepared Campus Fidei! 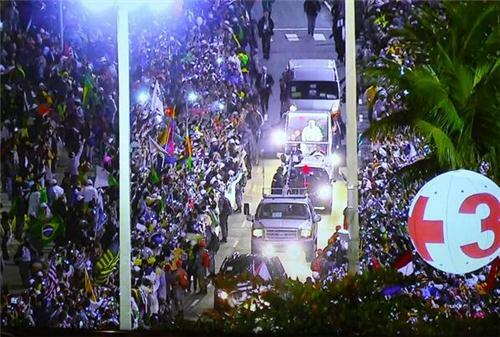 Renata Brito, AP videojournalist based in Rio, captured this bit of audio of the crowds. It took Francis nearly 40 minutes to travel about 2.5 miles down the road lining Copacabana beach. His sparkling-white vehicle scooted up a ramp and he's now atop the main stage. 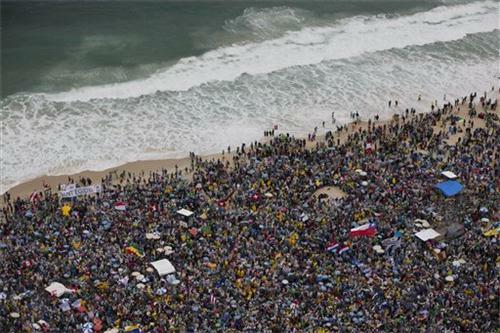 Thousands cheer for the pope at Copacabana beach. As the festivities continue, take a look at what the crowd looks like from above.